The Perfect Choice for Certified Organic Frozen & Dried Fruits Ingredients! 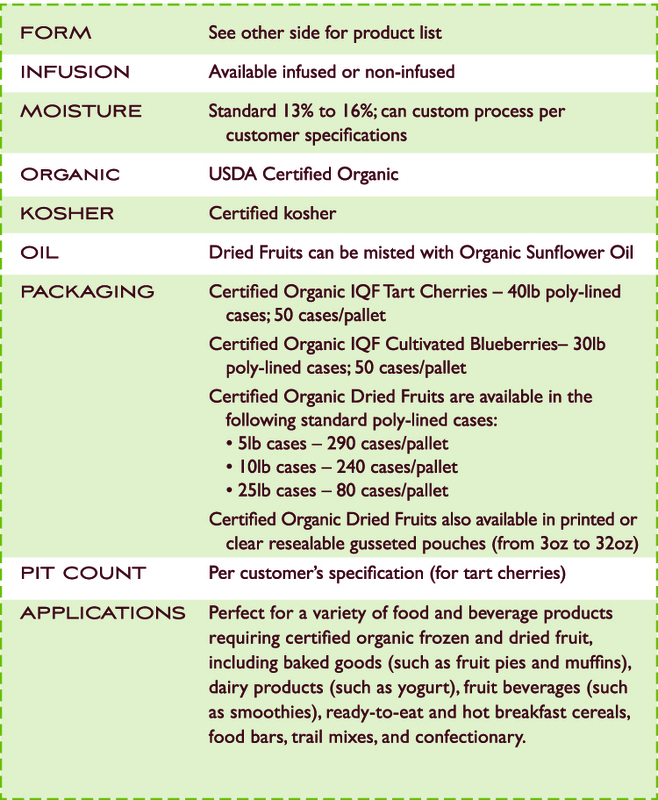 ROYAL RIDGE FRUITS' certified organic Individually Quick Frozen (IQF) fruits are perfect for food manufacturers producing frozen or shelf stable baked goods (such as fruit pies and muffins), dairy products (such as yogurt), and fruit smoothies. Their certified organic air-dried fruits are the ingredient-of-choice for food manufacturers of certified organic read-to-eat and hot cereals, granola, baked goods, fruit & nut bars, trail mixes, and other products. Royal Ridge ensures quality in all of their frozen fruit from the earliest stage in the production cycle-growing and sourcing premium fruit-through every stage of fruit processing and distribution. All organic tart cherries are sourced from Dorsing Farms. All organic blueberries are sourced from Dorsing Farms or from a select group of trusted U.S. or Canadian growers.